The market is saturated with whey protein supplements these days. It can become overwhelming trying to compare and contrast all the different options. Luckily, you have me here to help! What is the BEST whey protein powder? Good question, keep reading to find out! Protein is an important nutrient for the body, best known for it’s role in building and maintaining muscle. Protein can come from many different sources in our diet. Although we often associate meat with protein there are actually several different types of plant proteins as well. We will discuss these different sources of protein another day (it is really interesting to see the differences) because now I want to discuss whey, a very specific type of protein that has become very popular with the body building crowd. As with any other consumer good, there are countless options when it comes to whey supplements and it can be hard to tell the difference. There are shakes, bars, powders, snacks… even ice cream with protein these days. Let’s start from the beginning. Whey is one of the two proteins found in milk (casein is the other). It is also a byproduct of the cheese making process- when renin is added to milk, it curds. These curds are the casein, the whey is the watery stuff left over. Not to get too sciencey, but the whey is made up of BCAAs (branched chain amino acids) that are responsible for building and repairing muscle tissue. So, whey is a protein…comes from milk…is full of stuff that builds muscle. Got it? Good. 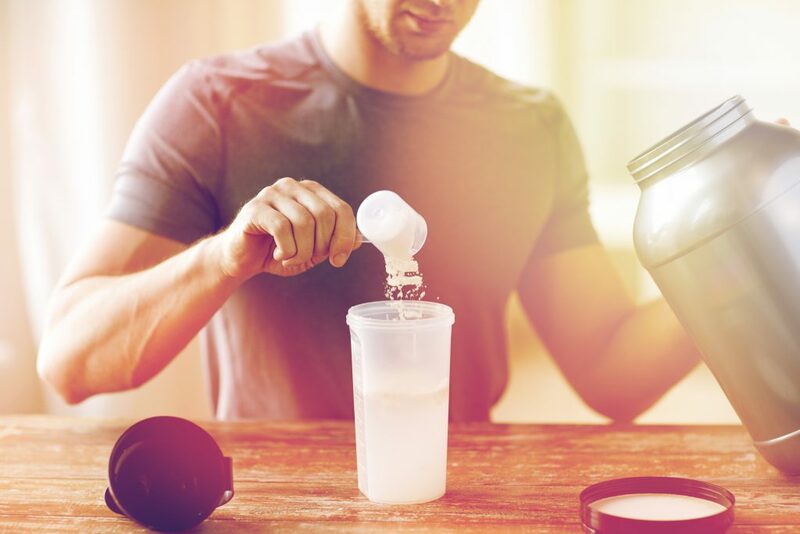 Oh, forgot to mention that one reason whey has become so popular is that out body absorbs it rapidly, so the muscle building can start soon after exercising with a post-workout protein shake. Whey can be used to produce animal feed. It can also be used in cooking and baking. For a nice read on whey, check out this article. There are different forms of whey you might see in the product ingredients. And yes, you should be looking at the ingredient list first when choosing your protein products. A lot of protein bars and snacks are actually high in soy protein, so if you are looking for a whey protein supplement, make sure whey is the protein being used. “Whey protein isolates” are usually considered the most concentrated form of whey available. “Hydrolyzed whey protein isolate (hydrolysates)” means the concentrated whey protein has been pre-broken down for faster absorption in the body. “Whey protein concentrate” is filtered less, removes less of the natural sugars from milk, means the product actually contains less protein than the isolates. 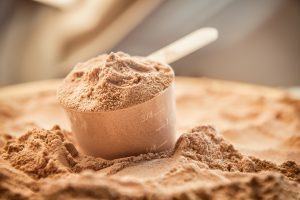 So, powders or shakes containing the hydrolyzed whey isolates will typically cost more because it considered a higher quality product (higher percentage of actual whey proteins). Something else to consider when comparing protein powders should bye calories per serving. Different products contain different amounts of calories and serving sizes can vary. Most products fall somewhere between 90 – 200 calories/serving. You really do have to look at serving size though. Some serving sizes are two “scoops” of powder, some are only one. One product may seem like it has few calories per scoop, but you may have to put 2 scoops in to get the amount of protein you are looking for. Something to consider. Another thing to consider when look for high quality protein powders is how concentrated the powder is. That is, what percentage of the powder is actually protein? The higher the better, because after all, we are purchasing whey protein powder to get just that, whey protein. For example, if a powder has 25g protein per scoop and a scoop is 30g, that gives ya about 0.83g of protein per 1g of product (the product is 83% protein, not bad). Good protein powders should be at least 80-90% protein, according to Muscle & Fitness. Powders comprised of the whey isolates and hydrolyzed isolates should meet this criteria, the whey concentrates may not. Always look at price. If a powder is much cheaper than a lot of the competition, there is probably a reason… it’s made up of lesser proteins! The protein isolates cost more because they are of higher quality and cost more to produce, unfortunately this cost is transferred to us, the consumers. This whey protein powder is a great product to start off our discussion. First of all, this powder is a protein isolate. This means it is more concentrated- this means more protein and less filler. In fact, Allmax Isoflex is 90% protein, an impressive feat. Allmax found a way to squeeze 27 g of premium whey protein into their powder with only 110 calories. This means this protein powder would be great for anyone looking to lose weight. It’s also sugar free, so if you want to increase protein intake while watching carbs, this is great protein for ya. Users also love the way it tastes. Allmax is known for how easily it blends with water or milk. Anyone who has used whey protein powders before is well aware of that dreaded after taste. You eventually get used to, but with this product that isn’t an issue. Folks love the chocolate and vanilla flavors, but Allmax actually produces 11 different flavors. They just added a birthday cake flavor- personally I would never try a “birthday cake” flavored protein powder, but hey, to each their own. So if you are looking for a high-quality, delicious protein supplement, Allmax Isoflex is a pretty safe bet. With an average rating of 4.4/5, it’s one of the most highly rated protein powders on the market. To see what other people are saying about Allmax Isoflex Whey Protein Isolate, click on above image. GNC produces a ton of awesome nutritional supplements and this is another popular product in their line up. It has a very long name, but pretty impressive stats. This product isn’t quite as concentrated as the Allmax, but it’s another highly rated powder that users love. Let’s start with a quick discussion on the serving size here. GNC describes a serving as 3 scoops for this product. 280 calories sounds like a lot of calories per serving, but realistically you can easily adjust this to your own needs. For example, 2 scoops would still give you 40 g of protein and drop you down to 190 calories. A quick not on leucine as well. Leucine is a type of amino acid that is used for muscle synthesis. Protein powders like to include this type of amino acid because it is so important for muscle growth. Learn more here. Otherwise, this protein powder rates very highly for taste and texture. It’s difficult to find a whey protein that doesn’t taste chalky, so when users find a tasty product that stick to it. You will appreciate how easily this protein powder blends with water or milk, resulting in a nice, smooth shake. GNC’s Pro Performance Amp contains only whey isolates and hydrolysates, the most wanted forms of whey. Your protein shakes will blend easier and be absorbed faster in your body. Optimum Nutrition’s Gold Standard Whey is the number one best selling protein powder on Amazon. It has an average rating of 4.5/5 with almost 16,000 customer reviews. Those are some serious numbers. These numbers tell me that a lot of people are buying this protein powder and a lot of people really like it. Optimum nutrition has done a great job of packing in a lot of protein without adding a bunch of extra calories. Users love how easy it blends. Most also agree that it tastes good, without being overly sweet. Speaking of taste, this protein powder comes in over 20 flavors. This will give you plenty of variety to ensure you don’t get too bored with one product. Stick with the one you love or try them all. Optimum Nutrition may have chosen wisely when they named this product. As one of the most popular whey proteins on the market, this powder could very well be the “gold standard” in protein supplementation. If you are looking for a great tasting powder that won’t bust the bank, Optimum Nutrition might have just what you need. This protein powder is produced by MuscleTech, the #1 best selling supplement company in America. This is another very popular, very highly rated whey protein. With one of the best protein to calorie rations, it’s pretty easy to see why so many people like this product. You might notice that this protein powder also contains 3 g of creatine. Creatine, as a supplement, is thought to help athletes create more muscle. It’s a very popular supplement and can be purchased separately on it’s own. Click here for a nice review of creatine. If you are watching your calories, this could be a good choice for you because you are getting 30 g of protein for only 160 calories. That’s pretty good. However, Allmax’s protein above can offer 27 g of protein for 110 calories, something to think about. Something else to consider about this product is that it’s protein concentration isn’t quite as high as some of the other powders discussed so far. 30 g protein / 46 g scoop = 65% protein. This means this powder has a little more of the “filler” stuff- little more fat, some carbs. Still a pretty good choice for only 160 calories. As the long name implies, this powder is 100% whey isolate. Products that advertise this know this is what most whey protein consumers are looking for. It’s the most concentrated form of whey. After all, this is why we buy whey supplements, we want an easy way to include more protein in our diets. The biggest thing that stands out to me about this product is the 110 calories per serving. This is one of the lowest calorie protein powders you are going to find. Allmax has just barely got it beat with 27 g protein at 110 calories, but Isopure is a close second. I only mentioned the vitamin B12, but this powder contains a high percentage of many vitamins and minerals- always a nice plus when you can get some extra nutritional value out of your protein powder. This is another really popular protein powder. As the name also indicates, the whey in this powder is in the isolate form (100% isolate to be exact). This protein powder is also reviewed favorably in terms of taste and texture. Most users agree it blends well and tastes good. Whether you are trying to gain muscle mass or lose weight, you can’t go wrong with Isopure Zero Carb protein powder. You can easily mix it with water or add to your favorite smoothie. With 14 flavors, you should have plenty of options to find one that works well for you. EAS produces one of the most popular whey protein supplements around. This protein powder is a favorite amongst users for it’s low price and high percentage of protein per serving. Reviews are pretty positive about the taste as well, however they don’t offer as much variety in flavor as some of the other brands. 30 g of protein for 170 calories is pretty good, very comparable to the other powders above. One thing to note about EAS, they are using whey concentrates in this formula- which we learned at the beginning is a less concentrated form of whey. Products with concentrates tend to have a few more filler ingredients, and this is the case with EAS. Some of these extra ingredients are artificial flavors and products that help with texture. I don’t mean to call out EAS on this because a lot of protein powders do use artificial flavors and ingredients. A big difference, however, is how affordable EAS Whey Protein is- averaging between $7 – $11 a pound based on what size you purchase. This makes this product one of the most affordable options on the market. EAS offers this product in 3 flavors: chocolate, strawberry, and vanilla. The classics. Some users are a little disappointed with it’s ability to blend easily with a spoon. If this is the case, it’s nothing a quick spin in your blender can’t fix. Overall, this is another very highly rated whey protein powder. Users love the taste. You will appreciate the low price. Naked Whey takes the whey protein game to a whole new level. For the purists out there, this is your protein. The name says it all. There is only one ingredient in this protein powder: whey protein concentrate. And not only does this powder ONLY contain whey, that whey ONLY comes from grass-fed cows. Thats serious dedication. This whey supplement contains no artificial sweeteners, flavors, or colors. Of course it is also GMO free and growth hormone free. Naked Whey also offers us a protein powder that is “undenatured”. Denatured proteins are proteins that have been broken apart (their bonds) by some manner. So the idea is that undenatured proteins still hold on to some of these bonds. I’ll admit, I’m no chemist, but after a little research I found that some people think undenatured proteins offer benefits to the immune system. A nice feature you may like about Naked Whey is that they have an unflavored option. Flavors are great for mixing a quick shake, but sometimes it’s nice to add whey powder to food. Unflavored whey could easily be added to yogurt, cereal, or baked into bread to bump up the nutritional value. Of course if you are looking for flavored whey powder, Naked Whey also offers their powder in chocolate, strawberry and vanilla. 25 g of protein at 120 calories is good. Also impressive is it’s protein concentration: 25 g protein / 30 g serving = 83% protein by weight. The pros for this product are numerous, but we have to discuss the one con as well. Price. We have all come to expect higher price tags anytime we see the terms “grass-fed” or “all natural”. Unfortunately this remains true for this product as well. This is one of the more expensive protein powders on this list. That said, if you like eating all natural products without all the added artificial junk, this is the perfect protein supplement for you. Naked Whey has developed a wonderful protein powder in this product. Reviews are overwhelmingly positive. If you are looking for a great, all natural protein supplement, you won’t be disappointed. I wanted to finish off the best whey protein powders with one last all natural product. All natural and organic products are more popular than ever and we are seeing more and more of these options in our supplements. This is great for us, gives us more selection to find the perfect product for us. Natural Force’s whey protein powder is very similar to Naked Whey. The biggest difference we see is that this powder is also certified organic. These cows are also all grass-fed, no artificial sweeteners or ingredients. Only ingredient is the whey protein concentrate. Something you may notice about this product is that it is only offered in 2 sizes: 13 oz and 2 lb. Most of the other powders allow you the option of buying 3-5 lb sizes which drastically cuts down on price per serving. Unfortunately, we have to pay a little more for our organic products. This product also offers an unflavored option, as well as vanilla and chocolate. Most users have positive things to say about the taste. The only real complaint is regarding mix-ability (is that a word?). Some folks report it is a little difficult to mix with a spoon, but use a shake bottle or blender and you are good to go. Natural Force is another superior whey product. If you really want a pure product you can trust you should try this one. When comparing whey protein powders, always consider calories, cost, and protein concentration (the 3 C’s). When looking at protein concentration, make sure you are taking a close look at serving size. Some powders consider 1 scoop a serving, some 2 or 3. A quick way to really compare is to divide grams of protein per serving by serving size- this will give you the concentration of protein per serving- higher is better. We just took a look at the 7 best whey protein powders on the market. In reality though, there are thousands of products out there. Many are comparable to some of the products discussed here, but these powders are the highest rated by actual users. You should consider why you are taking whey protein as well when choosing a product. Are you trying to gain lean mass? Lose weight? Improve athletic performance? The answers to these questions can help guide you to the right product for your. What is the best whey protein powder? Answer: the one that helps you reach your fitness goals without breaking the bank. I hope you found this review helpful. If you have any questions or comments I’d love to hear from ya. I have Whey issues, but I will pass this on to friends who use Whey. I’ve been using Hemp protein with an egg immune powder after workouts. Thanks for the comment James. It’s always great to hear about different protein sources, I’ll have to check out hemp protein, thanks again!